These days, the word “tools” often brings to mind a click-on choice on your computer screen that offers “Spelling and Grammar,” “Word Count” or “Track Changes”—hardly the old-fashioned pliers, screwdriver or adjustable wrench that word used to bring to mind. But household repairs that can be accomplished by computer command are still fairly rare (unless you are using the internet to find a favorably-rated home-repair person). No, to accomplish that fix of faucet or hinge or drawer track, old-fashioned hand tools still fill the bill. So having a properly stocked toolbox stashed in the workshop or utility closet continues to be a useful home-maintenance strategy. And besides, hand tools rarely crash! But what fix-it tools and equipment should you have at the ready? Start with a sturdy plastic tool or tackle box—the older metal ones tend to scratch or dent anything they touch—with a latch that won’t give way when weight-stressed. Be sure it includes a small flashlight or, better yet, a “wearable” LED headlamp for directing light into a dim work area hands-free. Now add basic tools. Pack flat-blade and Phillips-head screwdrivers of at least two and preferably three to four sizes. (As with all tools, avoid the inexpensive “tool bin” screwdrivers. They rarely work as promised, provide little leverage and may damage screw heads due to poor fit). A pair of work gloves will protect your hands from dings; the garden variety with blue rubberized palms and fingers are supple and give good gripping power. But just in case, stash a few Band-aids, a sealed wet-wipe pouch and some antiseptic first-aid cream in a small plastic bag to save a trip to the medicine cabinet if a small cut or scrape does happen. An assortment of wood screws, metal screws, bolts, nuts and washers should be included, ideally kept sorted in a compartmented clear plastic box. Take a moment, perhaps while watching TV, to mate each bolt with a properly fitting nut and a couple of washers. Then when you need a threaded fastener, you’re sure to have all the necessary parts. Pliers, both regular and needle-nose, plus a wire cutter, are essential. So is a tape measure. Add an adjustable wrench—maybe two sizes—plus a mid-sized “Vise Grip” (the trade name for locking pliers). Also useful: gripping pliers, the kind with several different hinge holes that change the width of the bite. Include a roll of electrical tape plus some heavy-duty duct tape (also known as duck tape)—the “Gorilla” brand gets rave reviews. If you are comfortable with electrical work, a wire stripper/crimper will come in handy. Safety tip: ALWAYS make sure the breaker for the circuit you are working on is snapped to “OFF” position; an inexpensive circuit tester is great to have in your toolbox, or you can test outlets with a lamp or other plug-in device to make sure no juice is flowing. A roll of masking or painters’ tape can be useful for temporarily holding things together, acting as a substitute for another pair of hands as you work on your project. Also a few zip ties, a roll of light wire, and several twist ties are great to have on hand. In the wrench department, a small socket set plus some open-end wrenches and a mid-sized adjustable wrench will be useful. Tip: If you choose to save space and/or weight by leaving the wrenches in the workshop, a one-inch wad of soft clay or putty, stored airtight (an old pill bottle works great), allows you to take a quick impression of a bolt head and return from your workshop with one or two properly sized wrenches, rather than a handful of possible fits. A small spray can of WD-40 or other penetrating oil will have myriad uses; a couple squares of sandpaper, a putty knife and an old toothbrush will be helpful when a surface needs to be cleaned of rust or accumulated crud. An electric drill will also come in handy. Small cordless models will fit into medium-sized toolboxes, letting you leave your heavy-duty drill/driver in the workshop to be retrieved for bigger jobs. Drill batteries get anemic when not used for a long time, so remember to periodically recharge your cordless tools to keep them ready for use. 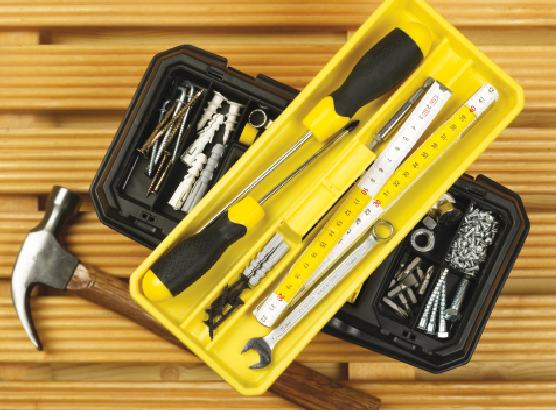 With this equipment in a tool box, you’ll be ready for most quick-fix projects. Gift idea: You might want to rummage through your favorite fix-it person’s toolbox, compare what you find to these suggestions, and see what tool-related stocking stuffers might be appropriate for this holiday season!